Live music sailing was a dream of me for many years. It has been my dream to have a small jazz orchestra playing on the boat while sailing to Ibiza for many years. This weekend we made a first step towards realization of my dream. Our friend and saxophone player Damien came over from Brussels, the hart of the European jazz, and played during our sunny sail! It was fantastic, next will be bass and drums, although there is limited space available on my regatta boat. 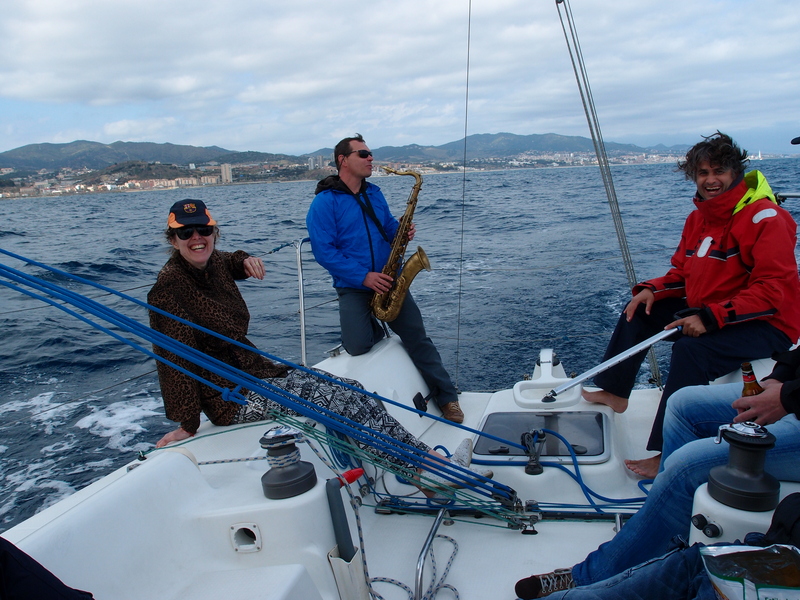 Live music sailing is something special, the combination of the wind, waves and music is an unforgettable experience. The sun was fully out there in the beginning of our sailing tour, and we enjoyed the sun and wore only t-shirts. This changed when our player started to blow, wind and clouds appeared as if the weather god was playing his game with us. The wind increased the clouds came, but we didn’t stop enjoying the music as you can see in the movie above. Next time we do an other sailing tour with music if the weather is a little better. I want to start this season with a number of music sailing trips, from saxophone to classical areas please call me +34 611 268 138 if you have any contacts that like to perform on a regatta sailing boat. It is nice to make music and perform with others. This is also the year we will start a trial for a movie at sea with Barcelona sail and even better live music sailing with video! Enjoy a fantastic sailing trip along the coast of Barcelona.